How Long Does It Take to Get GMAT Scores? Are you taking the GMAT soon or have you recently taken it? 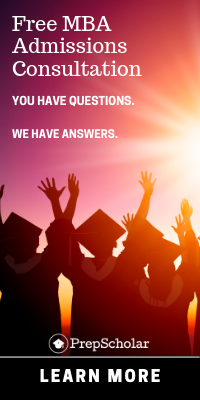 If so, you might be wondering, how long does it take to get GMAT scores? It’s important to know when you’ll get your GMAT scores so that you can plan how early you’ll need to take the test in order to get your scores sent in time for school application deadlines. In this guide, I’ll be explaining how long it will take to get your GMAT scores, when schools school receive your GMAT score reports, and how to use this information to plan for your GMAT test. Your GMAT score consists of five parts: verbal, quantitative, total score, integrated reasoning, and analytical writing. You will receive your integrated reasoning, verbal, quantitative, and total scores on your unofficial score report. You will receive all five of your scores when you receive your official score report. For more information about GMAT scores, check our our guide to the GMAT score range. As soon as you finish the GMAT, you will receive your GMAT unofficial score. After you complete your test, the computer screen will show your unofficial verbal, unofficial quantitative, and unofficial integrated reasoning scores, as well as your unofficial total score. You will also see your unofficial percentile ranking for each section. Check out this sample unofficial score report from MBA.com. As you can see, on your unofficial score report, you receive your scaled scores for four sections, including the total score, which is scored according to your quantitative and verbal scores. Your analytical writing section will be scored by human graders, so it’s not included in your official score. What is an unofficial score? Well, every student who takes the GMAT takes a slightly different version of the test, depending on where and when they take it. 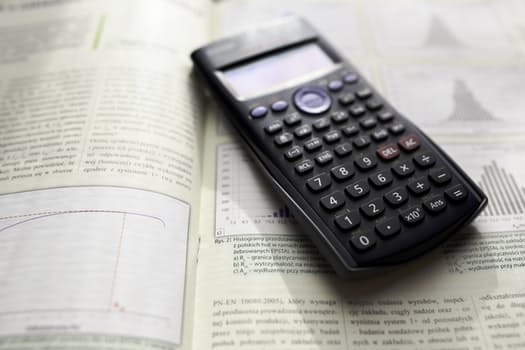 Your GMAT score and percentile for each section is compared with other students who are taking the same test. Sometimes, you may take a slightly more difficult or slightly easier version of the test. The unofficial score gives a snapshot of how you performed based to other test takers. However, the unofficial score doesn’t take into account whether your version of the test was slightly easier or more difficult than a different version. Your official scores are double-checked against other test takers to ensure that every test is weighted according to its difficulty. It’s very rare, however, for there to be a difference between unofficial and official scores. If there’s any difference, it’s usually only a few points. 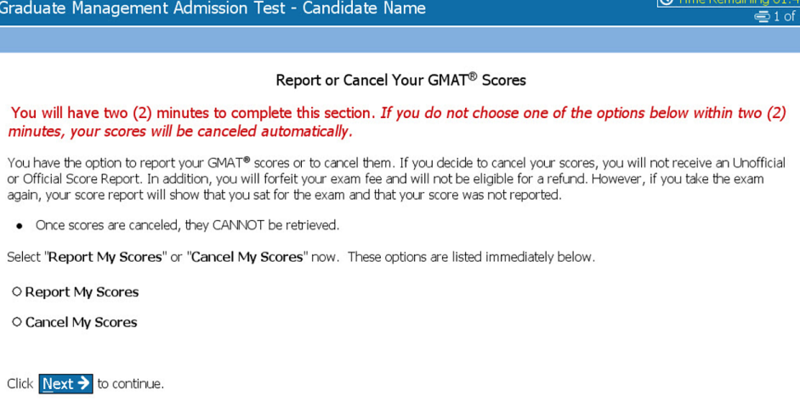 You have the option to cancel your GMAT score if you’re not happy with your performance. After viewing your unofficial score, you should decide whether or not you want to keep your scores. 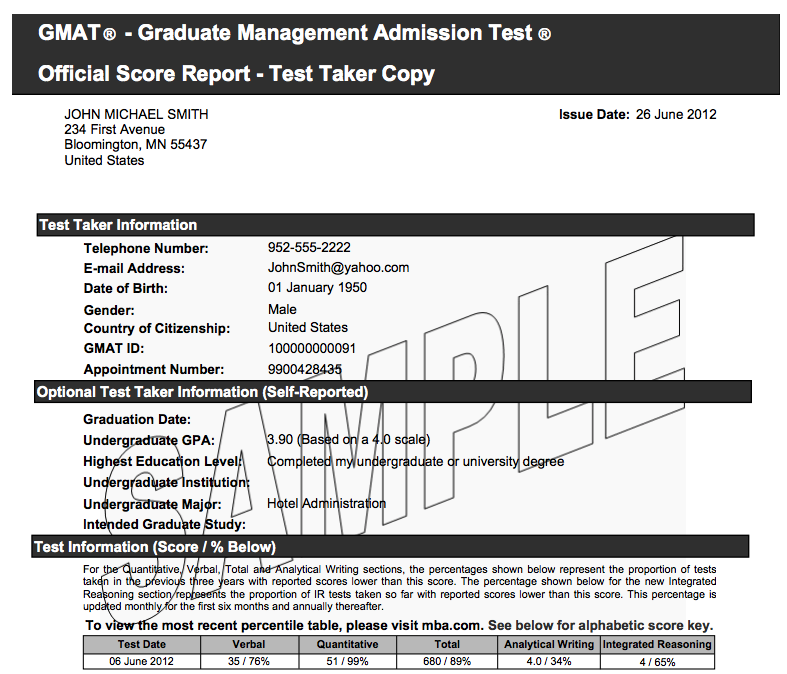 If you keep your scores, they will be sent to the schools you chose on your GMAT registration. If you decide to cancel, your scores will not be sent to any schools. Only you will know if you cancel your scores. You can cancel your score right after the exam at the test center for free, or within 72 hours of taking the exam (for $25). Your official GMAT score report will be available within 20 days of taking your exam. Once your scores are available, you will receive an email from Pearson VUE with a unique link to view your scores. You can also view, download, and print your scores by visiting MBA.com. Your official score report includes your final, official scores and percentile ranking for the verbal, quantitative and integrated reasoning sections. You will also see your final, official total score and your final, official analytical writing score. Remember, this is the first time you’ll be seeing your analytical writing score. How Long Does It Take Schools to Get GMAT Scores? While you’re the only one who sees your unofficial scores, you’re not the only one who will get to see your GMAT official scores. You have the option of sending your official scores to schools before or after the exam. Your GMAT exam fee includes sending your official GMAT score report to up to five schools. You need to select these schools at the test center before you start your exam. It’s a good idea to have a list of schools in mind that you want to send your scores to so that you can take advantage of this reporting on the date of your test. You don’t have to send any scores when you take the test, but it won’t be free if you send your scores at a later date. It costs $28 to send additional score reports. Remember, if you cancel your scores, the schools you select won’t receive your score report. The schools you select at the test center will receive your official score report within 20 calendar days of your exam (the same as you). It’s important to consider application deadlines when planning when to take your exam. Since it takes about three weeks to send your scores, you want to make sure you schedule your exam with plenty of time for your scores to arrive before the deadline. If you choose to send additional schools your scores, or to send your score reports at a later time, a $28 fee per school will apply. You can’t do this until after you receive your official scores, so you’ll need to wait at least 20 days to send additional score reports. Additional score reports will be sent about five business days after you place an order. Your GMAT score is valid for five years and you can pay to send additional score reports for as long as your scores are valid. If you cancel your scores at the test center, but wish to reinstate them at a later date, a $50 fee applies. After it’s reinstated, your official score report will be sent to the school you selected at the test center for no additional fees. All additional score reports will still cost $28 per report. 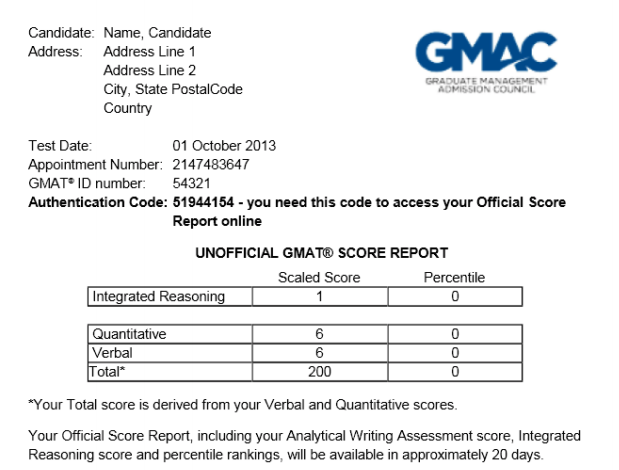 GMAT Score Reporting: What Does It Mean For You? It’s important to know when and how schools will receive your official score report. This will help you decide when to take the GMAT so that you meet all your application deadlines. For instance, if you want to apply to a school that has a deadline of December 1, you’ll want to take the GMAT at least 20 days before this so that the school will receive your scores on time. If you’re unhappy with your scores or decide to cancel them, know that you have to wait at least 16 days to take the GMAT again. However, you’ll likely need more time to study if you want to improve your score so seriously consider whether you have enough time to fit in a test retake before your application deadline. If you do decide to retake the exam, check out PrepScholar GMAT’s comprehensive online course. 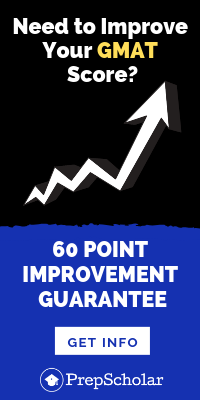 It’s the only online course that offers a 60 point score improvement guarantee! Summary: How Long Does It Take to Get GMAT Scores? You’ll get your unofficial verbal, quantitative, integrated reasoning, and total scores immediately after finishing the GMAT. You can decided whether you want to keep or cancel these scores. 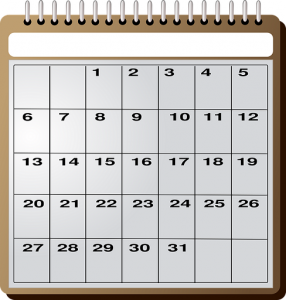 Your official GMAT score report will be available within 20 calendar days after you take the test. The schools you chose at the test center will also receive your scores at this time. You can order additional score reports after you receive your official scores. Wondering how long you should study for the GMAT? Check out our step-by-step guide to planning your GMAT prep. Still not sure when to take the exam? Learn more about choosing the best GMAT test date for you. Trying to figure out how important the GMAT total score is? Learn all about it in our GMAT total score guide. Next Next post: What Is a Good GMAT Score for Scholarships?